Sow seed outdoors or transplant greenhouse grown plants once frosts are over. 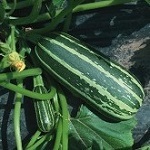 Marrows can be cut before the first frosts and stored in a cool, frost free place. Grows to approximately 3/4 the size of a standard marrow. Bush type, very high yielding with well marked stripes and deep colour.